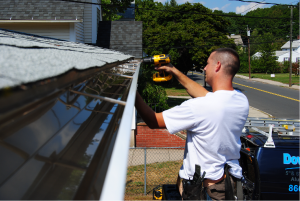 Dow Gutters is a leader in gutter repair throughout Bristol, CT. We specialize in both residential and commercial gutter repair services, including apartment and condo complexes. With nearly two decades in the industry, we guarantee your satisfaction. We understand that gutters may become damaged due to a build up of rain or snow, debris may clog the gutters, all resulting in the gutters being pulled away from the roofline. When this happens, water and moisture can seep under the shingles or behind the fascia causing extensive damage to the property’s exterior and interior. Our licensed and insured crew will quickly repair the broken gutters, ensuring the prevention of additional damage to the property. We can match most existing gutter colors and styles. Contact Dow Gutters today for gutter repair to your home or business!